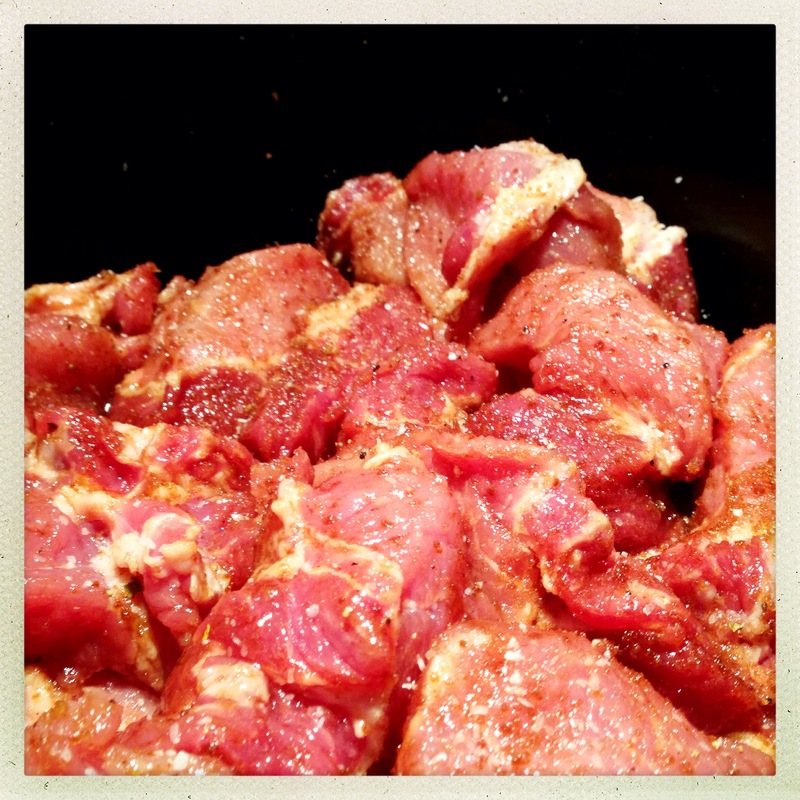 Meat slowly cooked in a blend of sweet and spicy seasoning until it’s melt-in-your-mouth tender…how can you go wrong? 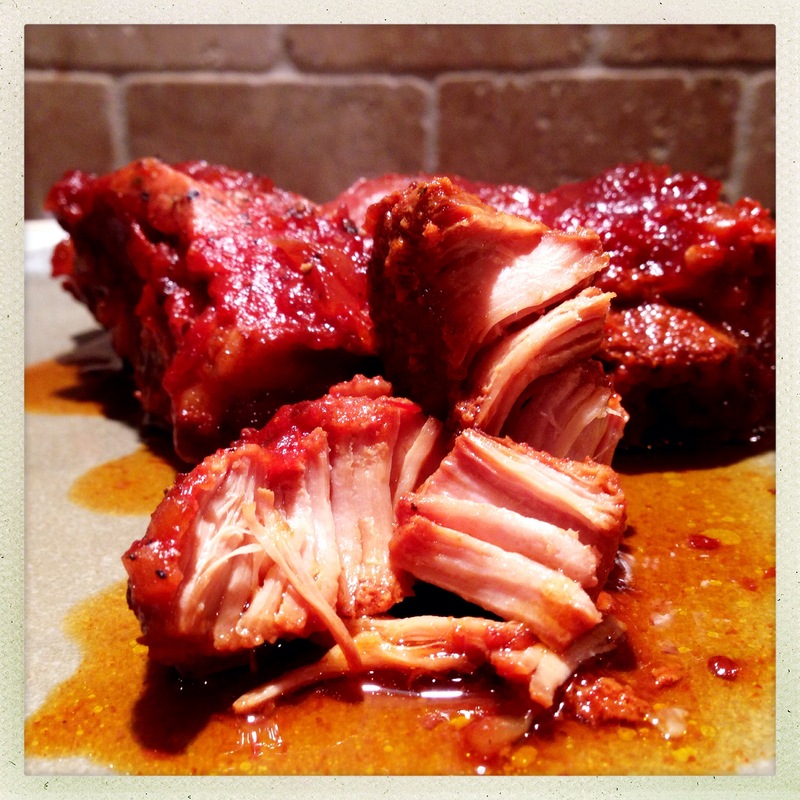 This recipe isn’t technically “BBQ” because it isn’t smoked. The entire cooking process takes place in a slow cooker. However, it is BBQ flavored, and it’s delicious. I’ve always wanted to create a BBQ sauce of my own, but have never gotten around to doing it. Part of this is that I tend to like a variety of different BBQ styles, and can’t pick just one to focus my efforts onto. I am a big fan of the vinegar-based BBQ of the Carolinas, but I also love the sweet molasses style sauces from Memphis and other regions. So, rather than pick one style, I set out to combine some of my favorite elements from multiple styles and create my own flavor profile. 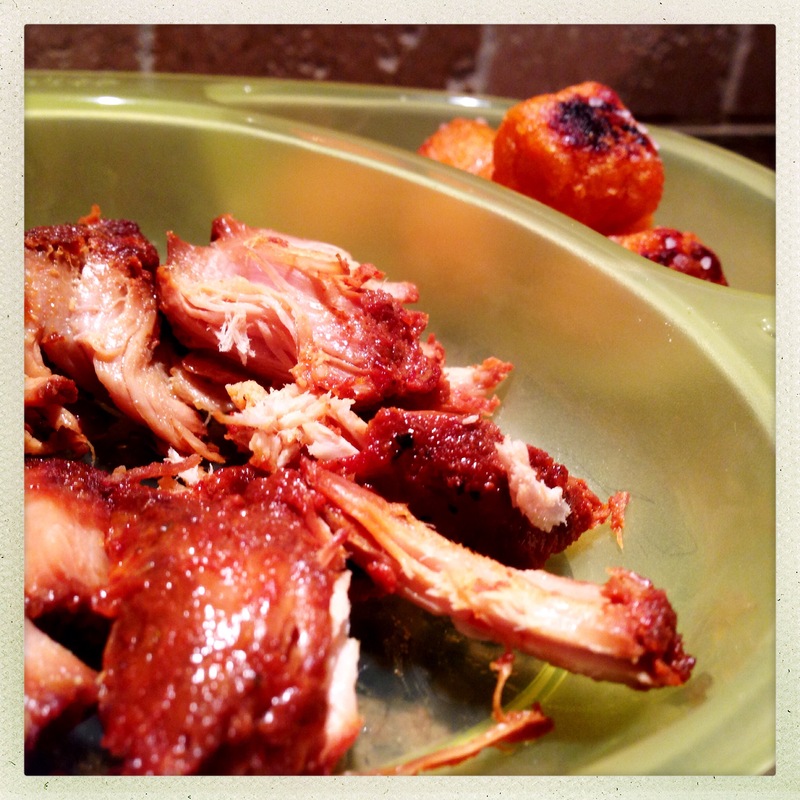 The end result was delicious – a little tangy, a little sweet and a little smoky. There’s plenty of brown sugar reminiscent of the sweet Memphis style sauces, tangy apple cider vinegar as a nod to the Carolinas…and a little maple syrup to give it a little Midwestern signature. The smoked paprika adds just enough smoky flavor to give the illusion that these ribs might have seen some time in a smoker before they made it to the plate. 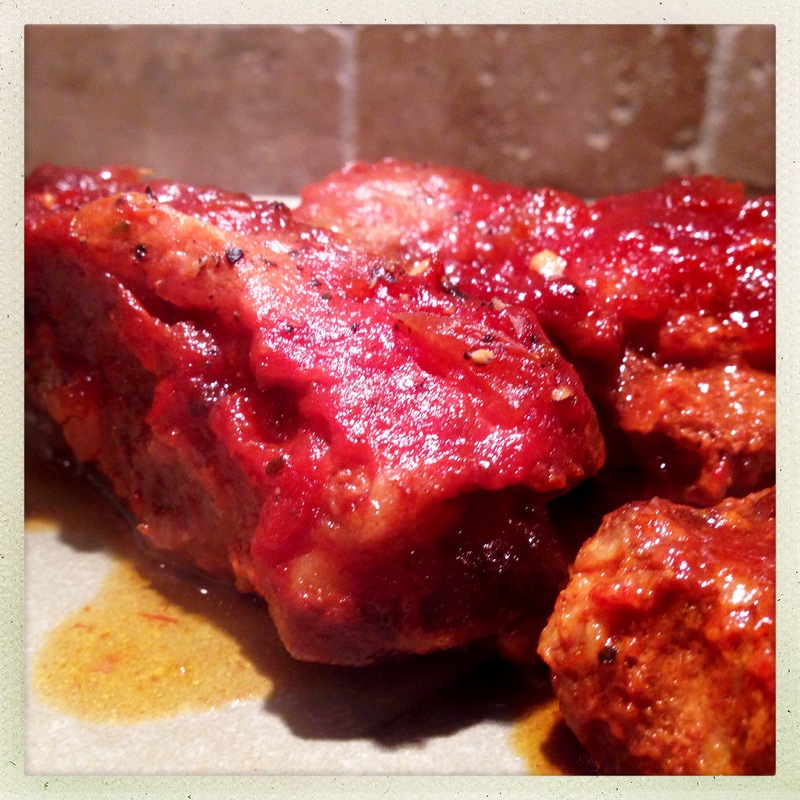 Whether or not these ribs are really “BBQ” is probably up for debate, but I guarantee they’re good eats for all ages. So, let’s get started! 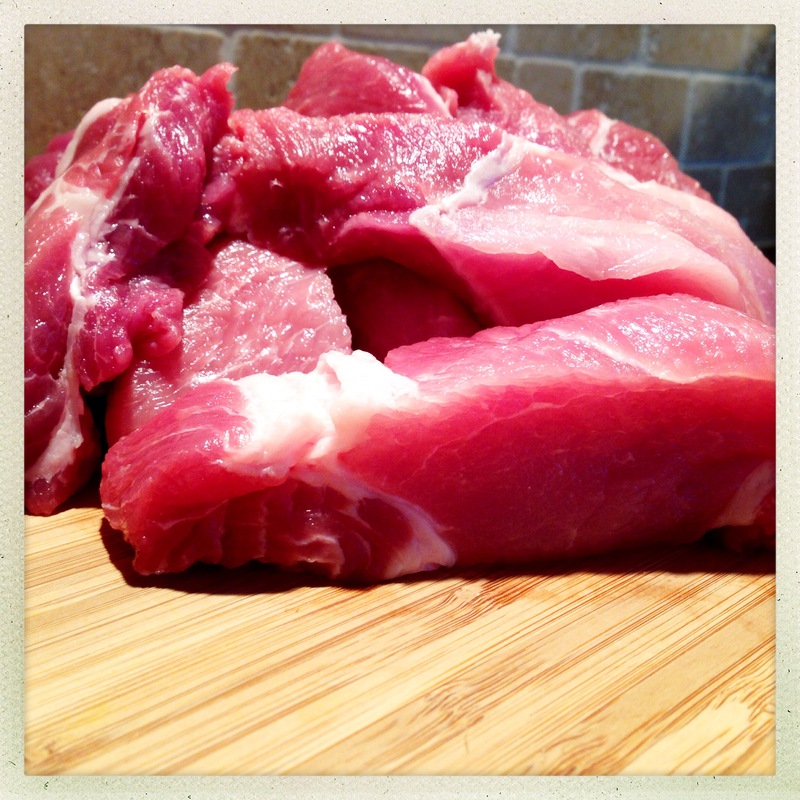 My butcher shop sells these country style pork ribs already boned and sliced into individual pieces. Occasionally, a few will still be connected, so just slice them all the way through as needed. Don’t trim the fat unless you feel compelled to do so – most of it will melt in the cooking process and simply contribute to the overall flavor. 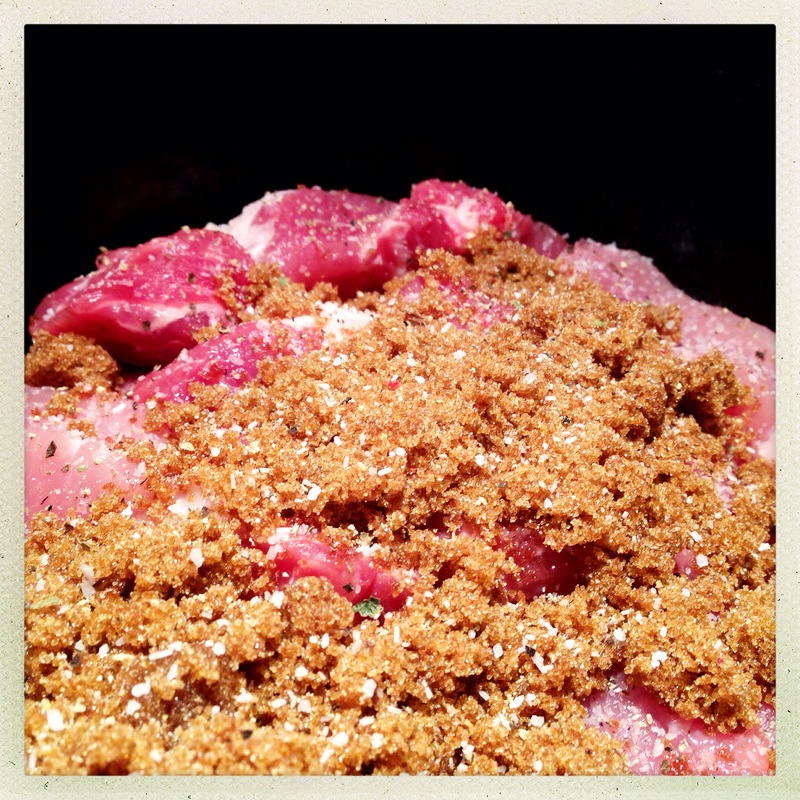 Place the ribs in your slow cooker and cover with the brown sugar, salt, pepper and paprika. I’m not sure if it makes a huge difference, but I like the idea of massaging the dry rub into the meat, so I worked the spices around a bit before adding any of the wet ingredients. 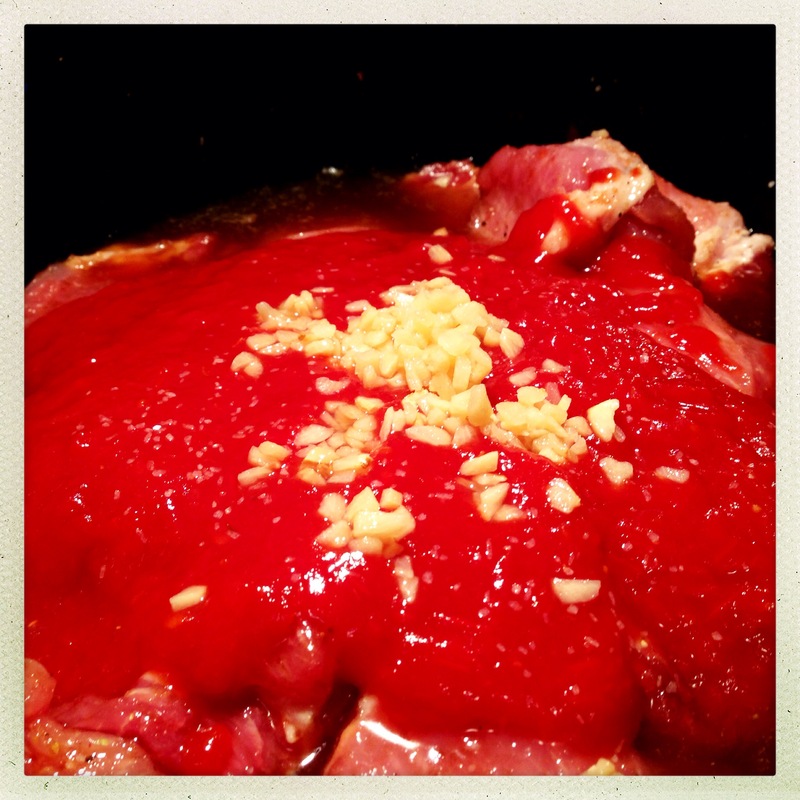 Add the vinegar, soy sauce, maple syrup and chili sauce along with the minced garlic. It is also important to point out that I used real maple syrup, not “pancake” syrup, which is really just corn syrup. I don’t put that stuff on pancakes, and I don’t put it in my BBQ sauce. Real maple syrup may cost a little more, but it is absolutely worth every penny, whether it’s sweetening up your breakfast or giving a boost to your BBQ. Add the finely chopped onion and the vegetable stock. The stock will thin the sauce out, but I think it brings a lot of great flavors to the meat, and some of my all-time favorite BBQ sauces are definitely on the runny side. 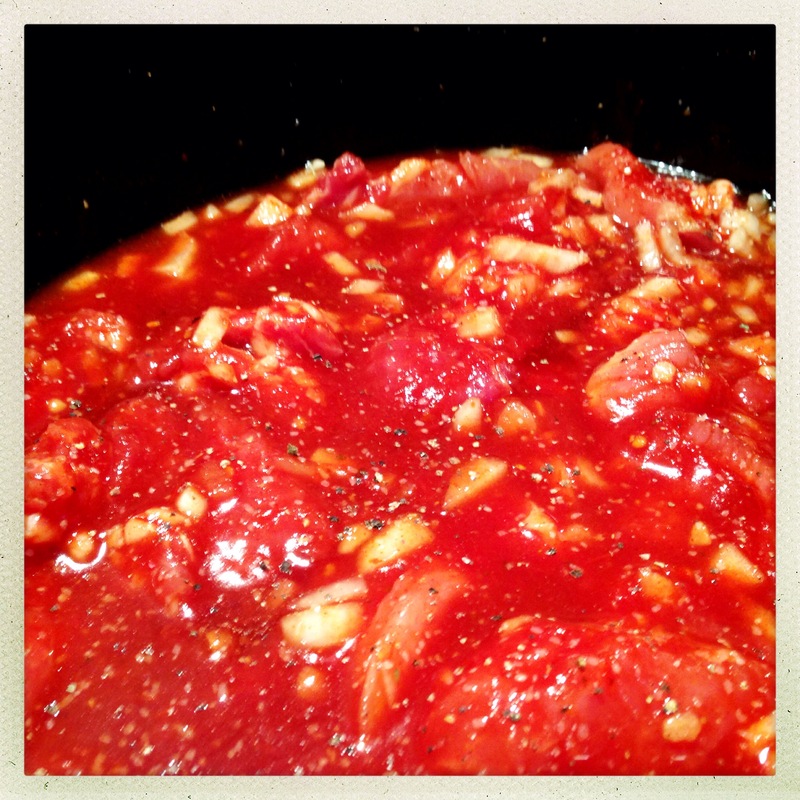 Stir the sauce to coat all of the meat. If some of the meat is above the level of the liquid, don’t worry, it’ll cook just fine. 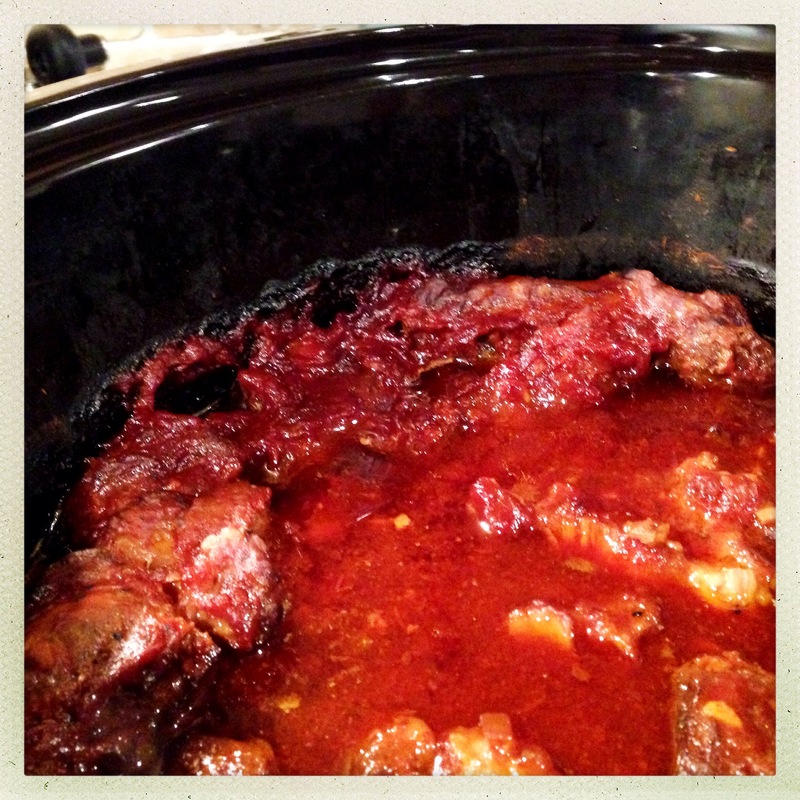 Set your slow cooker on low for 8 hours and let the magic happen. Your patience will be rewarded with the aromas of sweet and tangy BBQ throughout the day, and by evening you will have a pot full of succulent tender ribs. The ribs will hold together pretty well when you pull them out of the sauce, making them easier to plate than some slow-cooked meats that tend to fall apart. Don’t worry, though, they will definitely be fork-tender and juicy. BBQ meats pair well with a variety of sides. 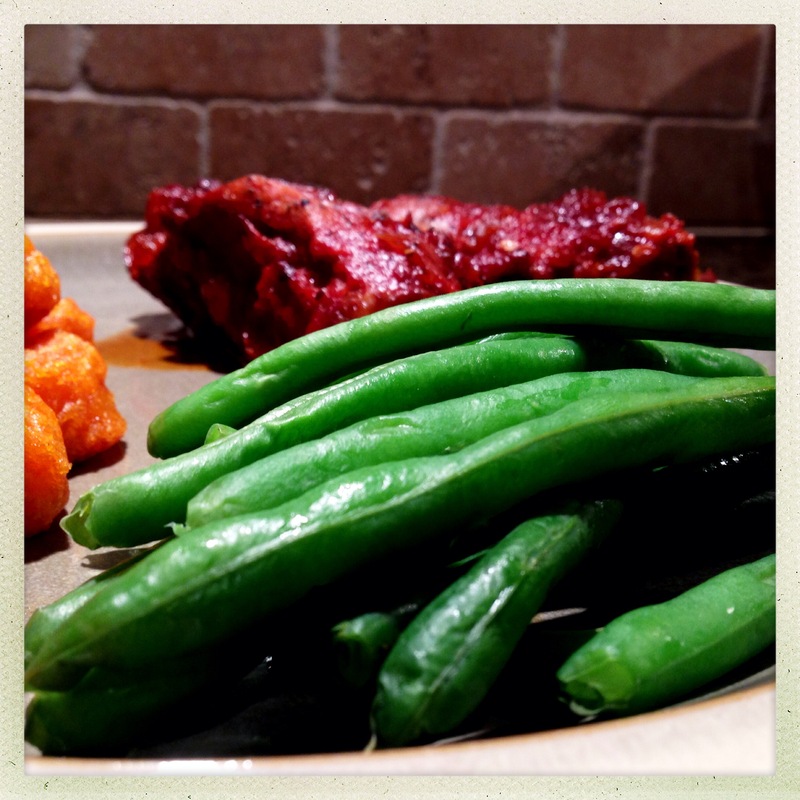 I like to keep things simple with side dishes so that the BBQ flavor is the star. 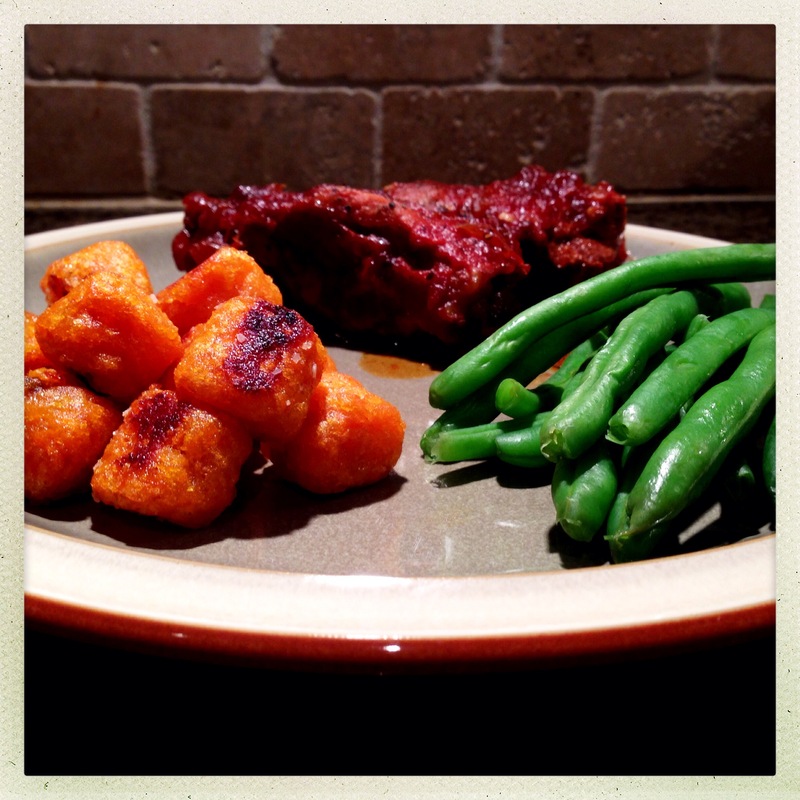 I served these ribs with some sweet potato tots and steamed fresh green beans. Nothing special with the green beans. Find some fresh green beans in the produce department and gently steam them for a few minutes until they’re tender, but not mushy. Season with a little fresh cracked pepper, extra BBQ sauce or just leave them plain. 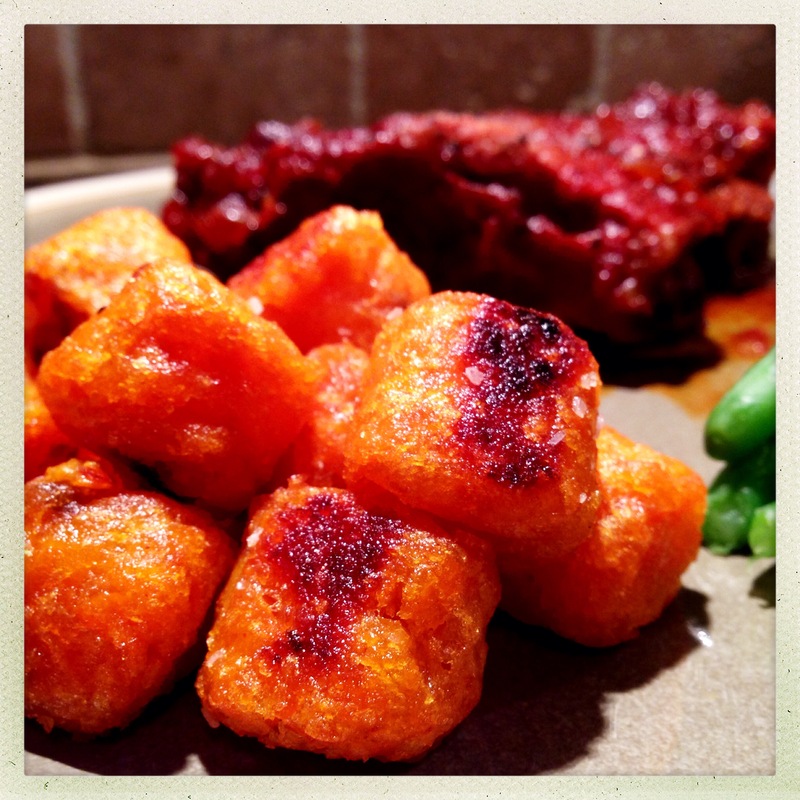 The sweet potato tots are a “cheat” product in that they come in a bag and the only cooking I do involves turning on the oven. That said, they’re delicious, and since they’re baked, they’re reasonably healthy. They’re also kid-sized and fun to eat, which is always a bonus with a healthy food! BBQ sauce is really just doctored up ketchup at its core. And ketchup is a (nearly) universally loved condiment for younger eaters. We called this “ketchup meat” and our little guy tore into it. This was my first crack at a BBQ sauce-based recipe without using a bottle BBQ sauce. It’s not perfect, but it’s a start. Give it a try, and tinker with the flavors until you find the balance that you like best. If you have your own BBQ sauce recipe or if you make some changes to this recipe that work for you, I’d love to hear about it. As always – Enjoy!